Hitman 2 features mission-based gameplay. On each level, the main character, known only as 47, is given a set of objectives to complete. Most levels require the assassination of one or more people. However, how missions are completed are up to the player, and there is almost always a large variety of ways to complete missions. One can take a stealthy approach and move in and out of the level avoiding confrontation, or take a more straightforward run and gun attitude. 47 can find disguises or remove them from an incapacitated person to blend in with his surroundings and access restricted areas. This plays in with the "suspicion" system; a bar beside the health meter on the HUD represents how much suspicion 47 garners. There are multiple ways to blend in more effectively; for example, the player can make sure to carry an AK-47 assault rifle while disguised as a Russian soldier. Despite the usage of a uniform, proximity to fellow guards will simply increase the suspicion as they would have an opportunity to more closely examine 47. Also, running, climbing and being in restricted locales are other ways to garner concern. 47's cover can be blown if suspicion gets too high, and the disguise will no longer be of any use. It is possible to switch between multiple disguises throughout the level. 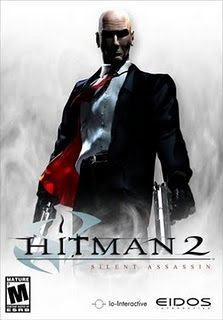 Hitman 2 also uses the concept of a post-mission ranking system, in which the player is given a status based on how they completed the mission, rated along a stealthy-aggressive axis, between "Silent Assassin," a stealthy player who manages to complete the level without being noticed and only killing two non targeting people excluding the intended target(s), and "Mass Murderer," a non-stealthy player who kills everyone. The game rewards the player for critical thinking and problem solving, encouraging the player not to treat the game as a simple shooter. Achieving Silent Assassin status on multiple missions rewards the player with bonus weapons. These weapons, plus items found in previous levels, can be carried over into future ones, allowing for differing means of accomplishing the tasks. Big weapons like rifles and shotguns cannot be concealed, thus the player has to either be wearing an appropriate disguise to match the weapon, or make sure no one sees the player use it.